Extend transmission distance up to 2 Km. Power requirement: Unregulated +10Vdc ~ +30Vdc. The AI-2541 is an RS-232/422/485 to fiber optic converter modem that secures data transmission by using fiber optic transmission to provide immunity from EMI/RFI interference. 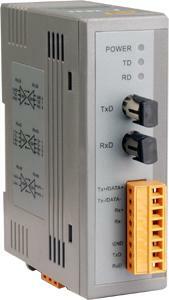 The AI-2541 is used for RS-232/422 point-to-point connections and RS-485 multi-drop applications for transmitting a signal up to 2 Km (6,600 ft). It's the perfect solution for applications where transmission must be protected from electrical exposure, surges, lightning or chemical corrosion.